Art is everywhere. Some mediums, such as film or highway billboards, are more apparent than others. If you look close, you can find art just about anywhere. For hairstylists like Australian-based Kerry Lush, a model's hair is the canvas. And for models like Tamisha Franz, being a living canvas requires patience and, more importantly, trust. The art of hairdressing combines haircutting, coloring, and texturing techniques. More lavish styles incorporate decorative elements such as flowers, pins, ornaments, etc. It's an art form that is typically noticeable in cinematic period pieces, however, they are the unspoken heroes of weddings, model photo shoots, and on the red carpet for Hollywood events. I had a chance to speak with both hairdresser Kerry Lush and model Tamisha Franz about one of their experiences working together within this art form. A recent photo shoot involved a black dress, a chicken, a beautiful face, and incredible hair. I found both perspectives interesting, since they're essentially looking for the same thing from each other: trust. When did you start working with hair? I started working with hair around fifteen years ago. After studying art at college and completing a textile degree, I decided to retrain in something creative that would pay the bills. I love working with hair, which I suppose is just textiles with people underneath. However, I dislike the industry intensely and find it driven by profit and cloaked in psuedo-science and fake artistry, where the client is king and bread and butter. 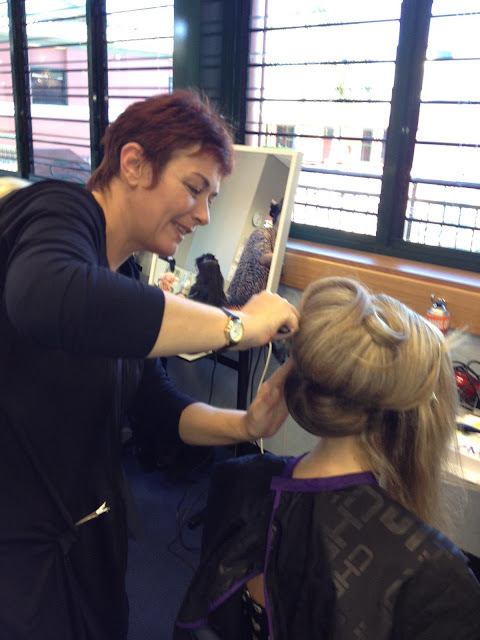 Has hairdressing become more (or less) important in the arts (movies, fashion, etc.)? Within this corrupt enviroment amazing hair artists have emerged, and true craftspeople continue to thrive. The Vidal Sassoon lot, for instance, ZGAT Academy and others strive towards excellence. Sadly, not the general rule with hairdressers. I love avante guard work and hair for film period dramas especially. Is hairdressing taken for granted by the general public? High end hairdressing is far removed from what the average hairdresser is expected to produce from day to day; I think the public in general appreciate a decent haircut, but it is often hard to find! What do you look for in a model's hair and personality? The models I use usually have long, virgin hair that is easily pliable. I choose models that have an unusual presence, far removed from the glamour look. I like my models to be confident, and happy to be directed. I draw inspiration from other photographers. Sergey P. Irons' work is amazing, with fantastic control of light, as well as his wife, Petrova Julian, who uses softer light; not as dramatic but very beautiful. Their photography is like painting. Kirsty Mitchell is a true artist and inspiration, and Tim Walker never fails to impress. I am still learning as I go with my camera. When did you first work with Kerry Lush? 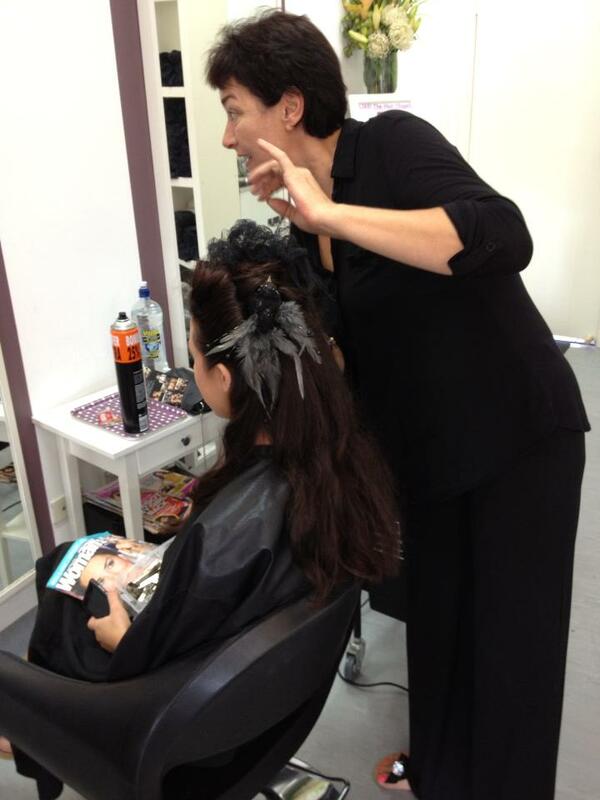 I first met Kerry when I was searching for a new hairdresser after moving to the Bayside area from the Sunshine Coast. I booked in at a salon she was working at the time. While she was cutting my hair we were chatting and realised we had similar interests in photography and modeling, and organized to collaborate and do a shoot. What did you like most about her? She made me feel very comfortable, especially for being at a new hairdressers. She is very down to earth and friendly, and I love her sense of creativity. Oh, and above all, I love her hairdressing skills! I have had her do my hair for two photo shoots and I loved it. She went above and beyond expectations. What do you look for in hairdressers? I look for someone I can feel comfortable around and someone who is, above all, honest. How do you know when to trust what hairdressers are doing to your hair? I never get anything too extreme done to my hair for the pure fact that I am worried I will not like what is done to it. However, after many experiences of having my hair styled for photo shoots and the style not suiting me at all, I would feel very comfortable making more changes to my hair, as Kerry's hair styling suited me perfectly! She knows how to make people look good! What else can you say about hairdressers in general? I am glad I chose the hairdressers I did that day; I don't believe I could have picked anyone better. I can't wait to work with Kerry again; her combination of creative hair styling and photography is beautifully unique. As seen in some of the images here, Kerry and Tamisha's photo shoot was certainly a success. With Tamisha's delicacy and Kerry's artistry, the two make a great team. I look forward to seeing more work from these, and many other, hairdresser-model collaborations. TRIVIA: In Africa, it was believed in some cultures that a person's spirit occupied his or her hair, giving hairdressers high status within these communities.